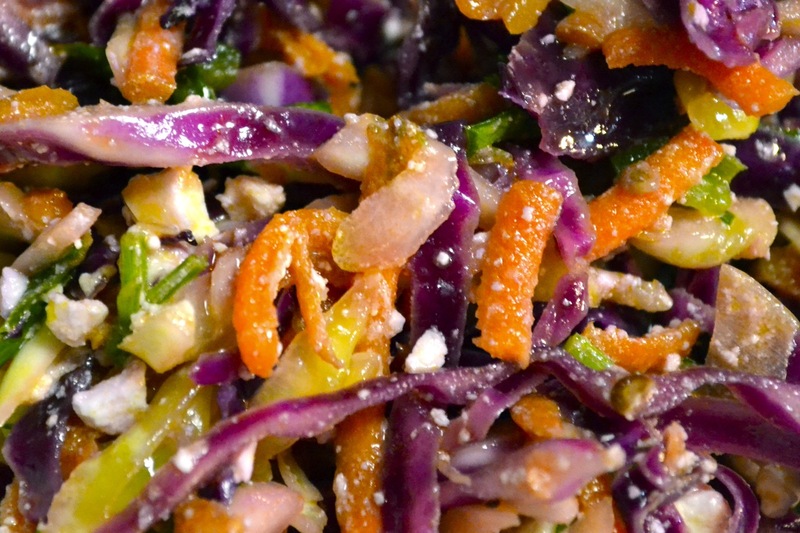 I have never understood why coleslaw is considered a “summer” dish. As with the other quintessential “summer” side dish, potato salad, all of the ingredients are at their prime in the winter and are basically the only ingredients you can get at farmers markets from December thru March. 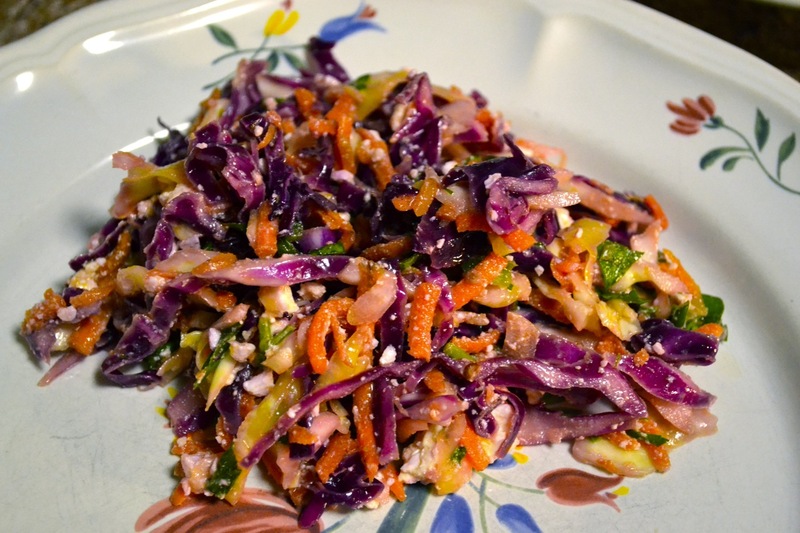 In this version I use green and red cabbage as well as shredded carrot and the result is stunning – like little slivers of vegetable jewels. This salad also packs a serious crunch punch, as everything is raw and provides a refreshing break from stews and slow-cooker meals (not that I am knocking them. I ❤ my slow cooker). This salad is great on its own with a handful of chickpeas or as a side for a simple grilled chicken breast or as a topping for a BBQ pork taco. The possibilities are endless. Enjoy! Active time: 15 minutes, Inactive time: 30 minutes; Serves 8 generously. 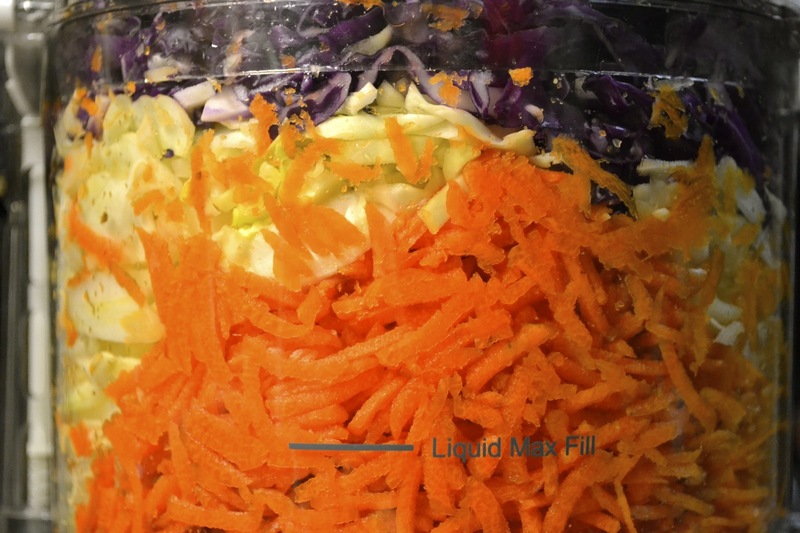 In a food processor with a blade attachment (or by hand) shred cabbages and carrots. Place in a large bowl with green onions. Combine vinegar through salt and pepper in a blender or food processor and process until thick and creamy. Add parsley and process 5 seconds more. Pour over cabbage mixture, toss until all the cabbage is well coated, then allow to rest for half an hour. 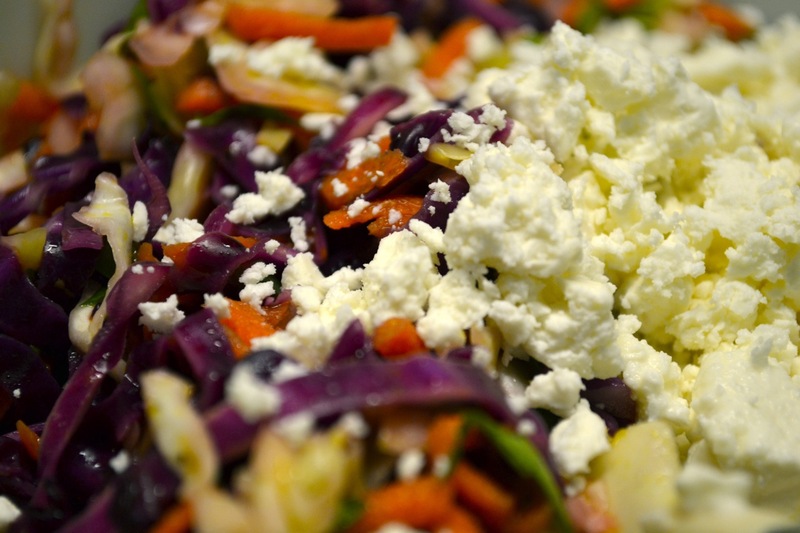 Right before serving, mix in feta and crushed red pepper, adjust salt and pepper to taste if need and serve. Natalie is doing her best to convince me that coleslaw does not have to be bland. This ‘slaw was definitely NOT bland, what with the feta cheese and such.